Asia Times has published a newspaper and YouTube video about Russia’s failure to deliver critical air defense missiles to China. China is missing key missiles that formed a key part of its strategy to pressure Taiwan. The missiles themselves form a part of the S-400 air defense system China is acquiring from Russia. Unfortunately for China these special missiles were involved in an alleged mishap at sea and Russia did not deliver them. The special missiles —the 40N6— that launch from the S-400 could potentially close down airspace surrounding Taiwan and keep out US warplanes in case Taiwan needed American support should China launch a major provocation or even an invasion of the island. 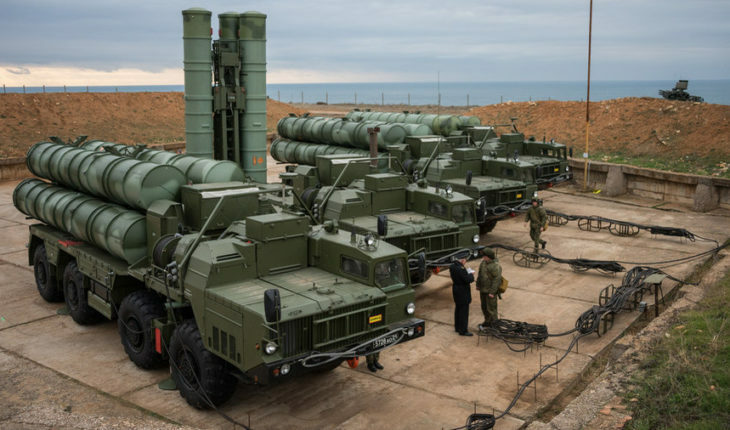 Unlike other missiles used by the S-400 system, the Russian’s claim that the 40N6 coupled with radar improvements could successfully block US stealth aircraft such as the F-22 and F-35. Also unlike the other S-400 missiles, the 40N6 has very long range, enough to keep out US fighters from bases in Japan, Okinawa or on US aircraft carriers. There is no information that the Begichev gave an international distress call or, for that matter that any Russian or other ships were dispatched to assist the vessel. Ust-Luga port is located near the Gulf of Finland, about 86 miles (110 kilometers) west of St. Petersburg. The Begichev and two other ships (“Ocean Lord” and “Ocean Power”) were transporting components of the S-400 air defense system to China. The Russian-Chinese contract for the system was originally signed in 2014. Of the three ships, the Begichev returned to port, and the Ocean Power, that left port after the Begichev also returned. Ocean Lord completed its trip to China (it had left port earlier on December 19 and arrived in Tianjin on February 9th). Ocean Power would set out again and arrive in China, but it was not carrying the crucial missiles. According to the Russians, the vital cargo of 40N6 missiles was stored on the deck of the Begichev. The missiles allegedly were damaged beyond repair and had to be scrapped. The cargo was insured and the Russian insurance agency agreed to pay compensation. The S-400 supports four different missiles –but the 40N6 is the only one that the Russian’s claim can kill stealth aircraft such as the F-22 and the F-35. For China to have a free hand to operate against Taiwan or even Japan, it needs to contend with top of the line American stealth aircraft that are already operating out of Guam, Okinawa and Japan (and Japan is adding the F-35 to its air force as well). The S-400 is a mobile, advanced air defense system that uses a number of different radars including units that can detect stealth aircraft. Two of the radars that are an optional part of the cluster use the L Band and VHF radar bands, which operate at a lower frequency compared to more precise X band radars or other military search and tracking radars in C or S bands. American stealth aircraft are designed to be less visible, especially at medium and long range from tracking radars particularly in the X band. The Pentagon calls this technology “low observable.” The Russians have added L band and VHF systems as an optional part of the S-400 complex to give it the ability to track US-made stealth aircraft. Neither L Band nor VHF systems have great accuracy against air targets, especially at long range. The 40N6 has a range of up to 250 miles and uniquely for tactical air defense missiles can operate from high altitude (18 miles above the surface). The 40N6 missile is hypersonic and the Russians say that unlike typical missiles that begin to slow down as they approach their target, the 40N6 does not lose speed but actually goes faster as it dives down to its target. In addition, the 40N6 is said to be able to better locate its target using using the missile’s active on board radar because it sees vehicles looking down where stealth designs are not as well optimized. In effect, the on board radar supplements the X, L and VHF radars on the ground and improves the accuracy of the missile especially against stealthy targets. There is yet another difference. The US and Israel (working with Raytheon) have shifted to “hit to kill” warheads for air and missile defenses (as for the THAAD andGround Based Mid-Course Interceptor, Patriot 3 and for Israel’s Arrow 3). But the Russians instead are using a blast fragmentation warhead with a kill envelope of around 100 meters. A hit to kill missile has no explosive warhead and has to physically hit the incoming aircraft or missile. The 40N6 with a more conventional but lethal warhead may be a better solution against aircraft rather than attacking missiles because modern aircraft can try and maneuver to avoid a direct hit. Russia has been making extraordinary claims about its military capabilities and new weapons and one has to take them all with a grain of salt. The S-400 with the 40N6 has never actually been tested against a stealth fighter plane. Indeed the design of the 40N6 and its supporting radars looks like an attempt to anticipate stealth’s potential vulnerabilities and combines different solutions (types of radars, speed of missile, blast warhead, “dive” from high altitude) to try and achieve the promised result. From Russia’s perspective the 40N6 approach is not at all surprising. Russia does not have real stealth technology and, instead is designing systems to kill stealth threats. China claims to have stealth technology, but India recently discovered it could easily detect Chinese J-20 stealth aircraft using older Russia warplane radars. China ordered 128 anti-stealth 40N6 missiles from Russia. How many were on the Begichev is not known, but it was not such a large ship and would not be able to carry all the missiles ordered. The Begichev carried its large cargo on its deck. There are photos of the ship loaded with large containers. The US –once the 40N6 missiles are delivered to China– will have to find ways to counter them in order to retain air superiority around Japan, Okinawa and Japan. Finding a solution will not be easy and China could gain a strategically valuable capability in the form of the 40N6 as an area denial weapon. Interestingly, the lost shipment of the 40N6 to China has raised eyebrows, even in Russia. How come all the missiles were lost or had to be destroyed? The issue was addressed by Russian defense analyst Pavel Felgenhauer. Felgenhauer writes for Novaya Gazeta, a publication well known for investigative journalism. Since 2001, three of its best journalists have been murdered because their reporting upset Russia’s leadership. Perhaps the most notorious (and best known in the West) was the killing of journalist Anna Politkovskaya in 2006 allegedly over her controversial reporting of the Second Chechnya war. Felgenhauer argued that the missiles going to China were sabotaged by Russia. Felgenhauer thinks the missiles were trashed because they don’t work, and the Russia did not want the Chinese to learn they did not work. Over promising and too much propaganda about the superiority of Russia’s weapons seems to be an issue that goes right up to the top in Russia and includes its President, Vladimir Putin. The result is that Russia has bought itself some years before the 40N6 will be delivered to China, if ever. Russia has many customers for the S-400 system, the most recent is Turkey, a NATO member and good prospects for sales among many US clients. It would not be helpful for Russia to have to admit to technical or operational issues.